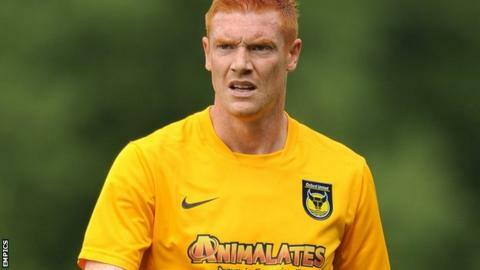 Dave Kitson's injury-time header helped League Two leaders Oxford United to a dramatic win against Dagenham & Redbridge. After early chances for Josh Ruffles and Kitson, James Constable gave Oxford the lead with a superb overhead kick. But Rhys Murphy equalised on the stroke of half-time with a lob from distance. Oxford piled on the pressure late on with Constable firing a volley straight at keeper Chris Lewington before Kitson converted David Hunt's cross. Match ends, Oxford United 2, Dagenham and Redbridge 1. Second Half ends, Oxford United 2, Dagenham and Redbridge 1. Substitution, Oxford United. Michael Raynes replaces James Constable. Goal! Oxford United 2, Dagenham and Redbridge 1. Dave Kitson (Oxford United) header from very close range to the high centre of the goal. Assisted by David Hunt. Substitution, Oxford United. Dean Smalley replaces Ryan Williams. Substitution, Dagenham and Redbridge. Chris Dickson replaces Josh Scott. Sean Rigg (Oxford United) wins a free kick in the defensive half. Attempt saved. James Constable (Oxford United) right footed shot from the centre of the box is saved in the centre of the goal. Corner, Oxford United. Conceded by Gavin Hoyte. Asa Hall (Oxford United) is shown the yellow card. Zavon Hines (Dagenham and Redbridge) wins a free kick on the left wing. Substitution, Oxford United. Sean Rigg replaces Josh Ruffles. Attempt blocked. Ryan Williams (Oxford United) right footed shot from the right side of the box is blocked. Foul by David Hunt (Oxford United). Zavon Hines (Dagenham and Redbridge) wins a free kick in the defensive half. Second Half begins Oxford United 1, Dagenham and Redbridge 1. First Half ends, Oxford United 1, Dagenham and Redbridge 1. Goal! Oxford United 1, Dagenham and Redbridge 1. Rhys Murphy (Dagenham and Redbridge) left footed shot from outside the box to the top left corner. Assisted by Abu Ogogo. Femi Ilesanmi (Dagenham and Redbridge) wins a free kick on the right wing.